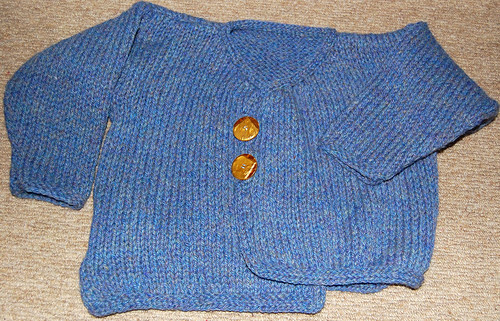 One Skein Cardigan, originally uploaded by indiaeden. I started knitting this little cardigan for Sid several months ago. The pattern is from "One Skein" by Leigh Radford. The pattern calls for several different coloured yarns,but I have plenty of this blue aran weight yarn,and thought it would work well. I finished all the pieces for this cardigan ages ago,but I hate sewing up,and the pieces lay pretty much forgotten in one of my knitting bags along with half a sock and half a stripey bag. With the cooler weather on it's way and Sid in need of winter clothes I resolved to finish this today,and I sewed it up...(real knitters shut your eyes now! )...on my sewing machine! Then finished the edges with an attatched i-cord,and added these art deco buttons that Sid chose himself. In case you are wondering it is meant to have uneven hems...that probably would look better in colour blocks. 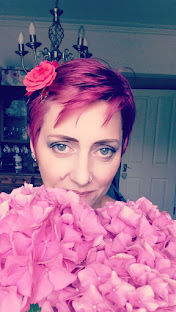 I'll try and get a modelled pic tomorrow.